Alumni are the brand ambassadors of an institute, they represent two identities, one side of corporate, where they work and another side of the institute, where they have studied from. Alumni branding leads to develop a strong brand image for an institute, alumni work exposure in corporate and sharing those experience with existing students are prominent for the success of an institute. Institute has a very strong way to connect with alumni and do alumni branding via digital media. Majority of foreign universities leverage social media to raise funds, build alumni community, placements etc. This campaign of IMT has developed a strong alumni community and how did this digital initiative help it in achieving the milestone. To leverage social media for building alumni relations and community. To build strong alumni bonding with Institution for placements, internships etc. To leverage alumni network for inspiration and motivation to existing students. Run a campaign to reach out to alumni and invite them for alumni meets across the nation in different cities. Conduct Alumni Speaker Session for students and post it on social media. Highlights the Alumni achievement on social media. Short video promotion talking about the best and memorable moments alumni have at the campus, their favorite faculty etc. Organize alumni meet in different cities across India, sharing the alumni experience at IMT. 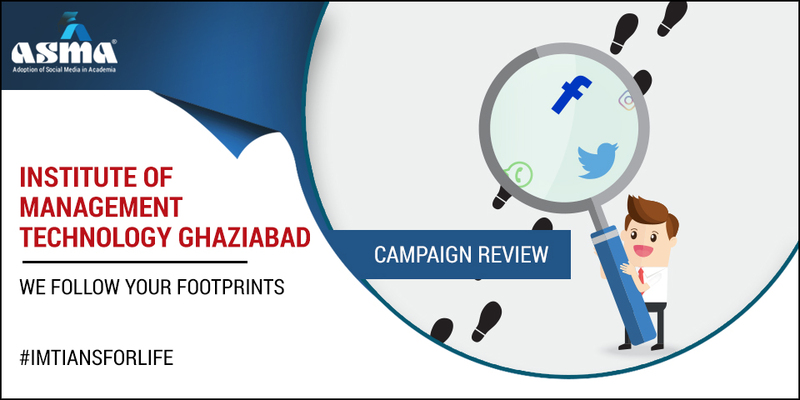 The objective behind the campaign is to promote alumni advocacy across the social media handling. The prominent top personality and top-level management alumnus are called to conduct sessions of mentoring, speaker series, leadership sessions for students, to highlight the achievements of alumni, inviting them for regular meets. It not only glorifies the Institute’s brand but also provides hands-on experience to students about the Industry latest topics, happenings, corporate cultures etc. Alumni are the foundation of an institution and a good network of alumni brings a lot more on the table for institutions. Conduct alumni speaker and mentor session for students to know about corporate cultures. Alumni testimonial about how the institution has helped them to grow. Posts are shot for highlighting the outstanding achievement of alumni and thus developing a strong brand image of the institute. Cross-link of twitter page has been added in each post to increase engagement and reach. An official twitter page is created to manage the alumni relationship and engaging alumni. The twitter posts are majority focusing on post-event promotions, and the success story of alumni meet. It is important to note that twitter post gives a fair background of from which batch the alumni belong to with a hashtags #classof93 and same have been mentioned post also. On Instagram, the user-generated content was created. Alumni were asked to post or share their pictures, rejuvenating the memories with hashtag #IMTianforLife. Thereby increase the level of engagement though like, and comments. Important to note that Instagram post is not officially rather use generated post (Alumni), thus creating a sense of belongingness, the essence of friendship is there, which can induce by the comment and description of the post. #IMTianForLife is created to leverage alumni networking for institution branding, placements, building community engagements, learnings and lot more.